Today was the big reveal for our Alternate Routes Sew Along at Up North Quilt Shop in International Falls, MN. We used our Alternate Routes Highway 10 Designs pattern which can be purchased from our Etsy shop as either paper or PDF download. If your interested in doing this project as a group, either as a Mystery or a Sew Along, we do offer month by month instructions for a fee. Please feel free to contact us at highway10designs@mymts.net for more information. 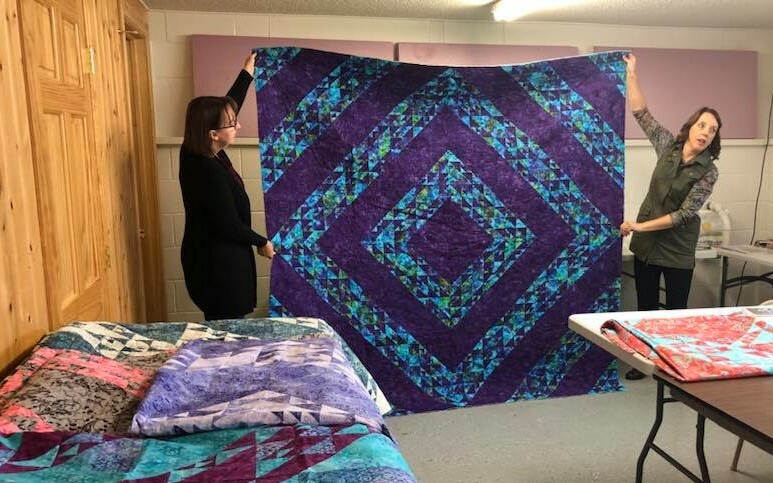 I loved seeing all the different colourways and layouts that the quilter chose for their projects. The pattern includes 20 different options for the layout but there are so many more options that could be used. Diana added an extra pieced border using the smallest elements in the pattern and it looks fantastic! Guess she didn’t get enough of all those tiny pieces! Sherrl added a beautiful embroider label to her quilt! Love the batiks in this next one, sorry I don’t remember everyone’s names! These next two were original layouts of the blocks. Here are more wonderful fabrics and layout options! This next one is Diane’s and she plans to add a few borders to make it larger. The last one is Missy’s, the shop owner, and she used two different blue Primitive Gatherings fabrics on hers. You can’t tell from a distance but when you get up close you see they are two different fabrics. Great idea! Thank you Missy for hosting this Sew Along, we really appreciate your support of our Highway 10 Designs patterns. Back in June I quilted Phyl’s Hello Sunshine quilt and you can see that blog post here. Phyl just sent me a few photos of all the embellishments she added to the quilt this summer to complete it’s look. Here is a picture from when I had it in June so you can see the difference. And here she has added tails to the kits, green ruffled fabric to the watermelon, flowers to the stems and buttons on the ladybug! Another button on the ice cream for a cherry on top and balloons on the bicycle basket! My favorite addition is the pinwheels in the jars. Here is the before and after. Thanks for sending the photos Phyl, it is always fun to see the completed quilt! Yvonne made this great Storm at Sea variation called “Our Hearts Will Go On”, a pattern by The Fabric Addict. You can find this pattern in their Craftsy shop here. This quilt is a wedding gift for Yvonne’s nephew and I think it has a great modern look that most young couples love. She purchased the fabrics from Road 17 N and was so happy with their customer service! She just called the shop and they pulled fabrics for her in her colour choices and put them in the mail for her! I quilted it with the Bora Bora pantograph, used white So Fine thread and Quilters Dream Blend batting. I’m sure the couple will enjoy this quilt for many years! September is here and I’m back to work! I was invited to teach our Highway 10 Designs Lug Nuts pattern to a group of quilters in Sioux Narrows, ON on Tuesday. It was a really fun day meeting new quilters in the area and I always love to see all the different fabrics they pick for their projects! Since it was a one day class we decided to just make a large table runner using three Hexagons from the pattern.